Looking for the best cordless hair clippers on the market? We tested the best cordless clippers from the top brands. As expected, companies like Wahl, Andis, Remington, and Philips Norelco sell the highest-rated home and professional cordless hair clippers, but surprisingly, there were some lesser-known products that performed really well. 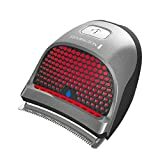 Nevertheless, buying the best wireless clippers depends on your specific needs, such as how you cut your own hair, your budget, and how much power versus battery run-time you need. And while this list may be focused on battery-operated machines, these rechargeable trimmers offer the same level of performance and cutting power as corded clippers. For example, the best Wahl cordless hair clippers are definitely the Wahl Lithium-Ion Pro Kit and the Wahl Professional Cordless Magic Clip, while the Remington Shortcut Pro is great for buzz cuts and shaving your own head. 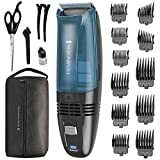 For an all-around hair trimmer good for your head, beard and body, both the Philips Norelco 3000 and Remington All-in-1 are excellent options. However, when we also took price into consideration, the wireless Wahl Color Pro was the top-rated choice. Whether you’re a professional barber or just a guy tired of visiting the barbershop every time you need a trim, these cordless barber clippers represent the leading products on the market. Check out our reviews to find a great men’s cordless hair trimmer for you. Wahl is generally known as a leading brand for men’s beard and hair trimmers, and this wireless hair clipper lives up to the company’s standards of quality, power, and precision. The lithium-ion battery allows you 2 hours of cutting, with the convenient option of a 10-minute quick charge when you are short on time. Furthermore, self-sharpening blades cut through all types of hair effortlessly and stay sharper longer than other models for minimal tugging or skin irritation. But what are sharp blades without a powerful motor? The heavy duty motor in this barber-grade unit offers 50 percent more power than other standard Wahl models. Combined with the lithium-ion technology in the rechargeable battery, you’re looking at one of the top battery-powered clippers in the industry. This product also comes with a complete kit, including various guard sizes, so you don’t have to worry about finding the right guide comb for the perfect length. Ideal for those who want to achieve a short trim at home, the Wahl Cordless Rechargeable Hair Clippers definitely tops the list of best cordless clippers on the market. Great for barbers, stylists and beginners alike, Wahl takes the prize when it comes to commercial-grade products that experts trust. The Wahl Professional 5-Star Cordless Magic Clip has become the top pick among professional barbers everywhere, and it combines the speed, precision, and versatility that stylists crave. One of the biggest advantages with these cordless barber clippers is the zero-overlap 2161 blades, which can cut precise lines in lightning-fast time. Similarly, the convenient adjustable lever makes fading and tapering hair easy, which is why you’ll also find this machine on our list of best clippers for fades. Built with a high-performance rotary motor that outshines its competitors, you’ll be able to cut through curly, coarse, and thick hair types seamlessly without issues. Along with a lithium-ion battery that offers 90+ minutes of run-time, the option to cut hair corded or cordless, and a set of 8 attachment combs, this trimmer is the total package. The Wahl Professional Cordless Magic Clip is a feature-rich clipper that’s a step above the competition and very much worth the investment! If you want to avoid a mess or don’t want to clean up hair, then these vacuum hair clippers may be the solution for you. Featuring a special suction fan to collect all the hair you cut into a large bin attached to the front of the machine, the Remington HC6550 Cordless Vacuum Hair Trimmer is the best of its kind. The secret behind its superior cutting-power is the sharp, titanium-coated blades, which have the ability to cut through even the thickest hairstyles without trouble. Even with the extra power needed for the vacuum fan, this cordless trimmer’s lithium battery still runs a full 60 minutes on just 4 hours of charge time. Lastly, it’s packaged with an 18-piece set, including 11 combs for every imaginable hair length you want to fade or buzz. The only downside of the easy-cleanup system is the extra weight. Otherwise, this well-designed and highly-rated hair clipper definitely gives you the most for your money. As the ultimate wireless model for home use, guys will love using this low-maintenance product on their head, beard, and body. Most men don’t want to have to reach for numerous tools to get their daily grooming done. The Remington PG6025 All-in-One Trimmer lives up to its name, as you can cut your own hair, shave your beard, trim your ear and nose hairs, and groom your pubic hair with this one wireless trimmer. 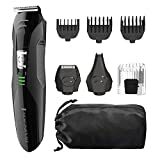 This set comes with 8 attachments, including a clipper comb for varying lengths, a nose, ear, and detail trimmer, foil shaver, three beard and stubble guard sizes. Other critical features include self-sharpening, surgical steel blades so you can cut through a thick hair of different types. The long-lasting, durable blades are accompanied by a powerful yet quiet motor so you can trim without getting a headache. The lithium-powered battery runs for 65 minutes, giving you plenty of time to trim your hair, face and body. The compact build of this unit also comfortably fits into your hand. For a versatile rechargeable trimmer guys can use for their entire grooming routine without sacrificing quality, check out this popular Remington model. 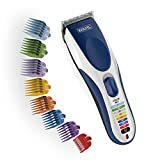 Philips Norelco is another reputable, well-reviewed company in the men’s grooming and styling niche. Don’t have a ton of time to stand in front of the mirror? Many guys are looking to shave some time off their grooming routine, and the Philips Norelco 7100 Hair Clipper delivers on that demand. These wireless clippers include DualCut Technology which allows you to cut your locks up to twice as fast than the average machine. These blades are double-sharpened for a precise, easy cut each and every time. For one, self-sharpening, titanium blades allow you to get as close to the skin as possible without producing nicks, cuts or skin irritation. The lithium-ion power of this wireless hair trimmer is insanely impressive, giving you 120 minutes of cutting time after only one hour of charging. The long run-time is even more striking when you put this robust motor to test using the “Turbo” button for increased cutting speed. One unique feature few other models on the market offer is the built-in adjustable comb that provides 24 length settings. Just select the length you want and use the machine, leaving no room for error when it comes to your ideal cut and hair length. Ultimately, the premium-quality and luxurious cutting experience of the Philips Norelco 7100 makes it one of the best men’s hair trimmers. Good for your head, beard and body, guys who need a great trim with a convenient, all-in-one solution will love this product. The Remington HC4250 Shortcut Pro definitely offers a unique value proposition compared to other cordless products on our list. As one of the top-rated clippers for men, this compact tool comfortably fits into the palm of your hand but comes with a curved blade that is extra-wide. This unique design aligns nicely with the contours of your head for the cleanest, closest cut possible. Best for shaving your head or cutting your own buzz cut or crew cut, you’ll love how easily this unit glides across your hair. This heavy-duty battery-powered trimmer comes standard with stainless steel blades that trim through coarse, thick hair with ease, reducing the risk of pulling on your hair. The 9 different guard sizes allow guys to choose a variety of lengths for the right cut. While the machine can be used corded or cordless, the lithium battery delivers 40 minutes of run time after a 4-hour charge. The convenience factor is enhanced by the fact that its 100% waterproof, works well in wet or dry conditions, and can be easily washed and cleaned under running water. If a cordless balding clipper is what you need or you just want to decrease the time it takes to buzz your hair, you’ll appreciate the Shortcut Pro. Plus, it’s really hard to argue with thousands of very positive reviews on Amazon. The rechargeable, cordless version of the Wahl Color Pro is one of the most popular hair clippers. Regularly ranked near the top of Amazon’s list of best sellers, this complete hair cutting kit provides everything you need for home use. This super easy-to-use product comes with color-coded guide combs and is designed specifically for beginners, taking all the guesswork out of picking the right guard for your haircut length. Nevertheless, guys shouldn’t look at the convenience and simplicity, and underestimate this wireless machine’s performance or quality. Although quiet and gentle on your head, the combination of the stainless steel blades and well-built motor offer the power and smooth cutting of a corded clipper. Many users and reviews have touted this model’s ability to cut close without any snagging or pulling, for a professional-quality trim you can enjoy for free at home. The battery runs for an entire hour when fully-charged, giving you plenty of cutting time. Plus, these are the best battery hair clippers for travel, as they can be charged using international outlets. If you want a barbershop haircut from the comforts of your home, these best-in-class wireless Wahl clippers are an obvious choice. While Hatteker may not have the same name recognition of these other well-known brands, the company seems intent on making a name for itself by building exceptional products. The Hatteker Hair Trimmer Pro sports an incredible 2.5 hours of run-time after a 2-hour charge, is charged via USB, and offers a completely waterproof body. Not only will this grooming tool last for hours, but the ceramic titanium blades are self-sharpening for a super clean cut without irritation. In addition to the detachable, durable, and high-quality blades, the built-in adjustable guide makes it simple to change lengths, ensuring a precise trim every time. However, the company still included a full set of 6 guard sizes for additional hair lengths and styles. Moreover, after a cut, all you have to do is rinse the unit under water to clean away dirt and hair. Lastly, this cordless clipper will never die on you in the middle of a cut. With an LCD display that displays the amount of battery life left, this undeniably sophisticated and cool feature always lets you know when to charge. Backed by a 1-year warranty, these waterproof Hatteker hair clippers are good for travel, home use, or wherever your grooming routine may take you. If you’re considering cutting your own hair at home or simply want to give yourself a trim in between haircuts with your barber, investing in one of these cordless hair trimmers is bound to give you amazing results. From long-lasting, rechargeable batteries to self-sharpening blades to powerful motors, our reviews of the best wireless clippers will make buying the right grooming and styling tools a breeze. What Haircut Should I Get?